Peter Sech graduated from The Northern Alberta Institute of Technology (NAIT) Denturist Technology program in 1991. He began his career with Wright Denture Clinic in 1992 as an apprentice under the watchful eye of Mr. Elmer Gierent. The skills and techniques learned by Elmer were passed on to Peter and in 1994, he became a certified denturist. In 1997 the clinic moved to its current site on Kingsway Avenue, and with this significant move, Peter became Elmer's partner in a position that he enjoyed. More recently, Elmer Gierent relocated to Calgary which allowed Peter to become the sole owner of Wright Denture Clinic. He works at the Wright Denture Clinic in Edmonton Mondays, Tuesdays, and Thursdays. On Wednesdays and Fridays, you will find Peter at the Drayton Valley Denture Clinic. Peter enjoys spending time with his family, traveling, and Edmonton Oilers games. 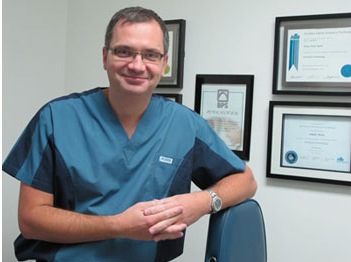 Admir Mesic graduated from the NAIT Denturist Technology program with honours on April 29, 2005. He joined our clinic in May 2005 to begin his internship and became a certified denturist in July 2007. 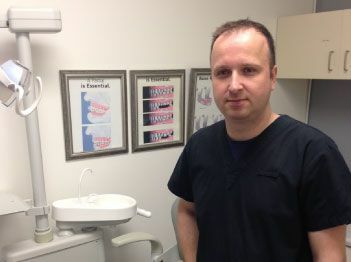 You can find Admir at the Wright Denture Clinic in Edmonton on Wednesdays and Fridays. Mondays, Tuesdays, and Thursdays he works at the Breton Denture Centre.